Margaret Reyes Dempsey is the author of The Benefactor, a romantic suspense novel currently available on Amazon. Shortly after learning of the publication of her first book, Ms Dempsey decided that a web presence would be a great benefit to her in promoting her work, and approached us to build her a basic website. Now, with her second novel not far from publication, the website has just been given a massive overhaul. Most authors understand that a web presence, both in social media and a personal website, is vital to keeping their name, and their work, promoted. In addition, it allows the author a certain relationship with her readers, beyond the sales point of Amazon. 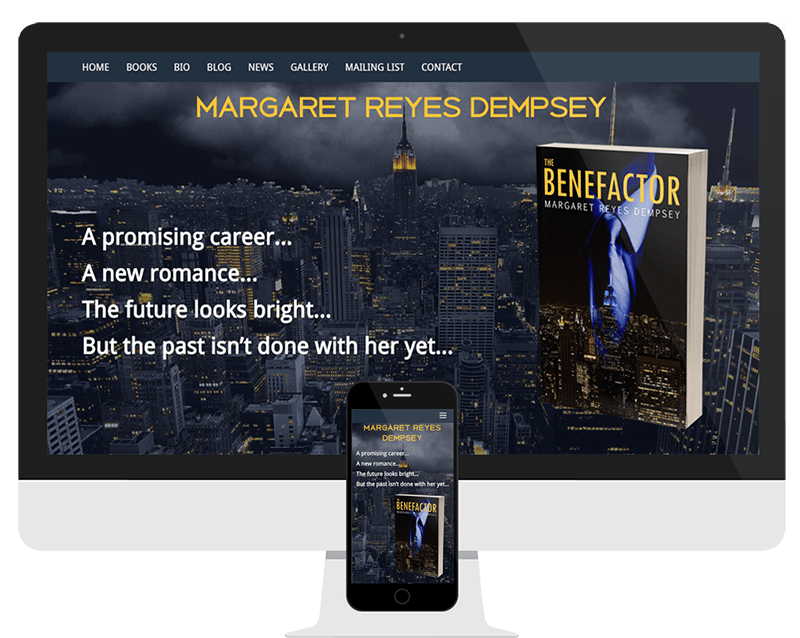 Margaret Reyes Dempsey approached us about building her website a few years ago, with the publication of her first novel, The Benefactor. This was a very basic website which, with the advent of responsive web design, needed a complete overhaul. The author also wanted to bring together her website and blog, which had previously existed as separate elements. The novels, both thrillers, are set in the author’s home city of New York, and it was that atmosphere of New York at night that we drew from when picking the theme for the website. Complete with an opening animation on the home page, the site looks to introduce the author’s work visually before introducing it literally.